Geraniums are tough. Geraniums are pretty. 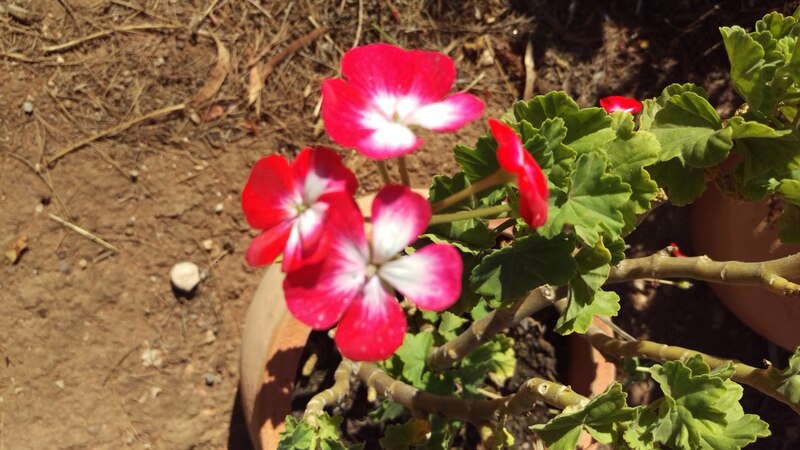 Geraniums can go without water, for a while, and still live. Geraniums can have different kinds of leaves. And lastly, geraniums have a huge range of differently coloured flowers. Oh, some geraniums have beautifully scented leaves. So, having said all of that, I don’t feel I need to say too much more, but I will anyway, because, hey, this is a blog, and I like to put my writing ‘out there’, and of course, blogs are good for doing that. And I have some photographs of some, possibly all, of our geraniums that we have growing at our place. Just for your information, we live around sixty kilometres north of Adelaide, where it can get quite hot at times, and is often very windy. Our geraniums manage well in these conditions, flowering nicely. Most of our geraniums came from cuttings I have made, using material from those I’ve found at various places. I remove a stem with some leaves on it, put it in some soil, and keep it moist, and let Nature do its magic. These are a few of our different geraniums, there are around three or four more different ones.Or that might be five or six. I really should count them, I suppose. It’s too dark to do it now! I’ve finally finished writing my rosella poem I mentioned in my last post. It isn’t a poem of great poetic note, I don’t think, but it’s a little bit of my thoughts about the birds I see around the place, and those feline creatures that kill and eat them. I am not a cat hater, but I definitely prefer the various birds that live all around my place. I am definitely a dog lover too, and it saddens me that our dog Missy will catch and eat birds too, if she can. That’s why I’m glad Missy likes lounging around on the sofa for a large part of the day, and all of the night, safely shut inside. Anyway, here is that poem, have a read, and leave a comment, I love to have feedback on my poetry! and as free as Nature made. every one, as they’ve occurred. I gave myself, and happily do. I think they’re beautiful, don’t you? a favourite of mine, that’s for sure! a new bird, hooray, what thanks I give! as red a red as you could get. but cats? Bah, I couldn’t care! what if a bird is a little too slow? like to do, but they get fed by owners. what Mother Nature has shown us. safest for birds, & they won’t have to hide! I mentioned the Adelaide Rosellas in my front yard here recently, and have been challenged to write a poem about these visitors. I like writing poetry, and do it often, and I’m always happy to take on a poetry prompt. So, thank you John Malone, this will be a poem you encouraged me to write! At the moment I’m thinking about the way the two words rosella and fella both rhyme, and that may lead me into a good path for a humorous poem, who knows? And the fact that the grey cat that’s been hanging around our place was in the same place I saw the rosellas may add an interesting hint of possible danger for the birds … Who knows? Well, hopefully I know, this is the poem I have to write! Time for a Little Garden Time? I have to confess that my time spent in our garden recently has been a rushed trip out in the back yard, with hose in hand, and spraying water on some of the plants that need water. And that’s pretty well it. To be fair to myself, some of our weather recently has been very summery, as in stinking hot and hellish. But we’re heading for some milder weather soon, and I feel like it’s the time I should stay out there, after the watering is done, and the plants are all fresh and lovely. I’ve seen some lovely clouds up in the sky, these past days, and have been thinking about snapping some more cloud, blue sky, greenery combo photos, not for any particular reason, but just because I love to look at that combination. I think sitting outside in a cool spot might me nice tomorrow, I could look at lovely things out there, sit, think, write a bit. Missy would like being out there with me too, I’m sure. She likes being outside sometimes, when there are birds, and other interesting things happening … As long as the ‘interesting things’ aren’t reptiles, I’m very happy to have my lovely dog outside with me! We have strawberries growing in hanging pots again, and my husband and I both spotted on that had ripened up beautifully well. He picked it and ate it, and said it tasted lovely. I’m glad it was one we managed to get at before any birds could! I don’t mind birds getting the strawberries, not really. We have two small muntries bushes growing on the front veranda, and I certainly don’t want the birds to get those fruits. They’re an Australian Native plant, with tiny little fruits, which are quite tasty, and have high levels of antioxidants and vitamin C. Those muntries are ripening up well, and perhaps picking the ripest ones can be another of my tasks for tomorrow. Of course, when I get up tomorrow, I might change my mind on what I want to do, one of the great things about not having a job, (and it being the weekend too), is that I can pretty well do whatever I feel like doing. And if I feel like doing not much of anything at all, that’s fine too. The life of leisure suits me well, I’m an expert at sitting around and wondering about things … Do you like doing not much at all, or are you one of those people who always feel they must be doing something? Our dog, Missy, is an eleven year old pharaoh hound, and recently she has been showing a strange behaviour. We don’t know if this is just another odd sight hound thing, a reaction to something happening in her environment, or a medical related thing we should be worried about. This thing is something that is called Zoomies, when a dog suddenly gets up and races at great speed, and with little care about what gets in the way. So Missy has been doing this leaping off her sofa, and racing off into another room. Very odd to see, that’s for sure. Apart from that behaviour, she has also been getting into her crates, to lie down. This is a new thing for her in recent times. When we had a house full of dogs, the two crates we have were used, but once Missy became our only dog, as the oldies left this world, that’s when Missy really became the queen of her sofa. She’s still using the sofa, but she sometimes gets in the crate I put her meal in, to lie down in there for a rest. This, as I’ve indicated, is a new thing for Missy. She’s still eating well, and seems fine in all other ways. She was in the other crate, yesterday night and this morning, and that isn’t something that had happened for over a year. I think it’s probably a reaction to environment, rather than a health related issue, but I’m keeping an eye on Missy, that’s for sure. Missy thinks this room is kept too cool, I suspect, and I think it is too, but my husband likes it cool, and I can always go and put more clothes on, if I’m troubled. We are suffering a dramatic hot period in South Australia, having had out hottest January ever in the time white people have here recording such things. I wonder whether that weather, and our subsequent air conditioning, cooling this living area where we spend much of our time, humans and Missy too, could that be relevant too? Missy’s spot on her sofa is a very cool spot, with the air con sending much coolness along for her. And another recent ‘new’ thing is the visitor we have had here a few times recently. Our son has moved out of home, and has now got himself his first dog of his own. He was brought up with dogs always in the house, but this dog he has is his very first dog of his own. She is a greyhound, named Sharon. A lovely tall black greyhound, and if people think our pharaoh hound is tall, whoa, they’d be stunned at Sharon’s height! So Missy has had her home invaded several times by a great bit dog, who, although hasn’t actually done anything nasty to her, still seems to loom, based solely on her height. Missy has been to Sharon’s house too, but she still feels protective of her own home, but she’s not stupid to make a fuss, she just keeps away and things go fine. But I think Missy may have actually found safety in the crate up the other end of the house, on those occasions. So that’s how it’s all going. At the moment, Missy has had her lunch and is stretched out comfortable on her sofa, which has a new covering over it, in case there had been something sharp in her bedding that had been causing the ‘zoomies’. She looks happy enough, we’ll just keep watching her, and see how it goes. Living with dogs can be a strange thing, sometimes.